Courtesy of Keller Williams Realty, Santana Properties Team. 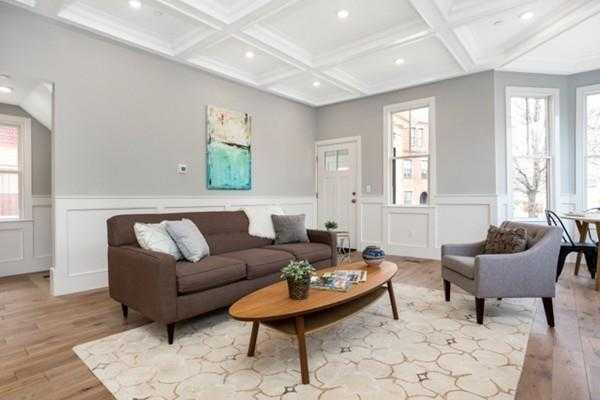 ELEGANT DUPLEX in the HEART OF UNION SQUARE! Everything is at your doorstep. This condo is in an amazing location. Walk out your door, day or night to the newly built Bow Market which features 30+ independent food, art, retail shops around a public courtyard. Enjoy a beer at Remnant Brewery after work or skip the line at the Neighborhood Restaurant for brunch! The exterior blends historic Victorian charm to make this property stand out among the rest. The open concept living, architectural details, gas fireplace are unparalleled. The gourmet kitchen is a chef’s dream, featuring Jenn Air professional appliances, custom white shaker style cabinetry, and quartz countertops. This spacious condo features 3 bedrooms and 2.5 baths. This unit has in-unit laundry, a designated storage area, 1 off-street parking spot, has easy access to all major routes and Downtown Boston and steps to the proposed green line. Welcome to 42 Bow! Disclosures: Seller Never Lived On The Property. Square Footage And Condo Fee Are Approximate. Seller Will Not Negotiate Any Discrepancies. Taxes Reflect Property As A Multi-family. Seller Will Touch Up Exterior Paint When Weather Permits. Please, send me more information on this property: MLS# 72450799 – $974,900 – 42 Bow St Unit 1, Somerville, MA 02143. I would like to schedule a showing appointment for this property: MLS# 72450799 – $974,900 – 42 Bow St Unit 1, Somerville, MA 02143.